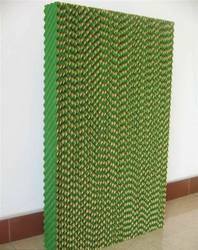 Product DescriptionWe are reckoned as the foremost manufacturer, trader and supplier of Greenhouse Cooling Pad that are offered in variety sizes, thickness and other related specifications. Manufacture with the aid of latest technology at our well-developed manufacturing unit, this product is designed in compliance with set industry norms. Moreover, clients can avail the offered range from us at market leading prices. 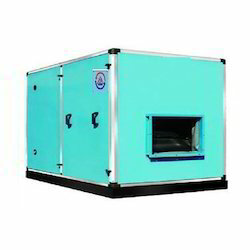 • Capacity Available : 2000 to 40000 CFM with single Blower & 4000 to 80000 CFM with Single & multiple blowers. • Base Frame : The total assembly is mounted on a horizontal member of channels. 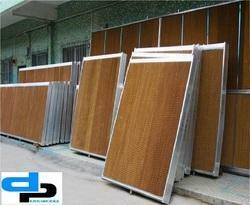 • Fan Section : Constructed in GI/SS Sheet with Inspection Doors. • Wet Section : Constructed in GI/SS Sheet. 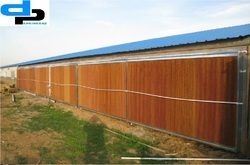 • Water Tank: Constructed in GI with Frp coated/SS. • Blower : Dynamically Balanced Forward Curved, DIDW Type Make ETIP / Imported. • Electric Motor : Three Phase, TEFC squirrel cage induction motor of standard makes (Crompton, ABB and Kirloskar etc.). 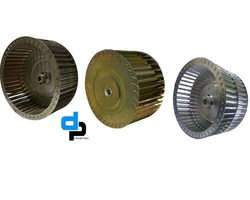 • Drive Pulley : V-Groove with/without Taper Lock hub. • V-Belts : Fenner make. • Pump : Monoblock make Crompton / Kirloskar. 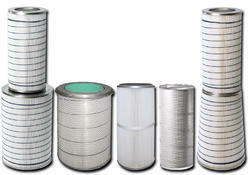 • Filter : HDPE/Aluminum/GI Mesh Filter, Micro Vee, Hepa as per requirement. • Pipe Fittings : PVC/GI piping with all Necessary fittings such as float valve, quick fill, overflow & drain ports. 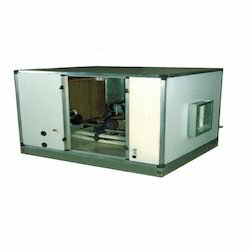 Manufactures High Quality Single Skin Air Washers as per customer requirement under the brand name " DPENGINEERS"
Manufactures High Quality Single Skin Air Washers as per customer requirement under the brand name " ETIP"
• Structure: Structure of Air washer is made up of Extruded Aluminum Section of high quality. • Base Frame : The total assembly is mounted on a horizontal member of heavy steel channels. • Outer Covering : Constructed in Pre-Coated Sheets. 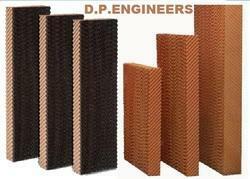 • Insulation: To prevent the heat exchange insulation is done with high Density PUF • Inner Covering : Constructed in 24 SWG GI Sheet. • Pump : Mono-block make Crompton /ABB/ Havells/ Kirloskar. 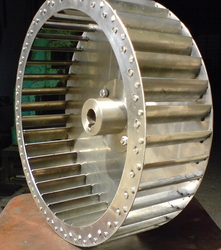 We are providing to our prestigious clients an exclusive range of Boiler Fan Wheel. 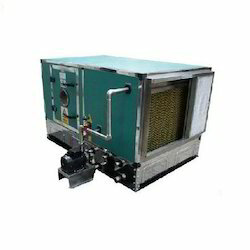 The Boiler Fan Wheel needs less maintenance and consumes low voltage. All these products are available in different sizes and dimensions. Our products are offered at reasonable rates. Our range is well known for their features like user friendly, durability and easy to handle. The offered products by us are widely demanded and are reasonably priced. provides wide range of capacities of Double Skin Air Washers which suits to the requirement of consumers under the brand name of "ETIP ". Pump : Mono-block make Crompton /ABB/ Havells/ Kirloskar. 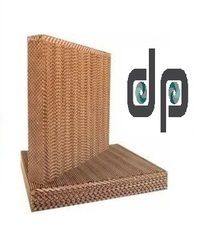 Product DescriptionWe are offering our clients a comprehensive assortment of Duct Air cooler pad that is manufactured using sophisticated machines and advanced technology. Also, we ensure that only high grade basic material is used in the manufacturing process of this product. Moreover, we also provide our clients with customization facility of this range in order to meet their variegated application requirements. Our quality controllers inspect this range on diverse aspects to ensure its flawlessness. 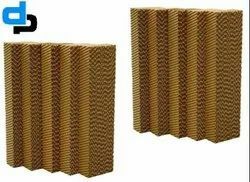 Cooling Pad For Poly House Brand: D.P.ENGINEERS Product Code: DP Availability: In Stock Made up of cellulose, Size: 6 ft.x 2 ft. x 8" width Size: 5 ft.x 2 ft. x 8" width Size: 4 ft.x 2 ft. x 8" width Size: 3 ft.x 2 ft. x 8" width For your requirement, Kindly contact us by mail or Phone. We are amongst one of the distinguished names betrothed in presenting to our clients a wide and extensive consignment of Imported Cellulose Paper Pads. Offered assortment of pad is designed with supreme precision by making use of optimal quality factory material altogether with contemporary techniques and tools. In addition, their accessibility with us in multiple stipulations and modified forms makes these a preferential market option. 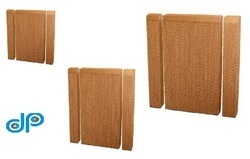 Being the foremost names of the industry, we are involved in providing an extensive range of Brown Cellulose Cooling Pads. Owing to high demand, our products are available in varied specifications. Backed by rich industry experiences; we are highly engaged in manufacturing a premium quality range of Cellulose Pad Cooler. 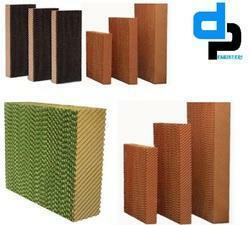 We have gathered a huge customer base in this domain by offering an astonishing range of Cellulose Pad. 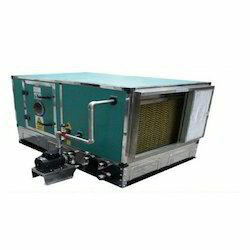 This pad is widely used in several industries to be installed in ventilation system for providing fresh and clean air. The provided pad is manufactured at our modern production unit with the aid of ultra contemporary techniques by utilizing superior quality components. 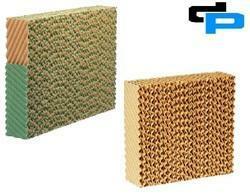 Further, this pad can be purchased from us in different technical specifications at market leading prices. In order to eradicate the production defects, these products are thoroughly tested on defined parameters of quality. Our offered pads have gained admiration from every nook and corner of the country for their remarkable quality and durability. These products can be availed from us in different specifications options at leading market prices. 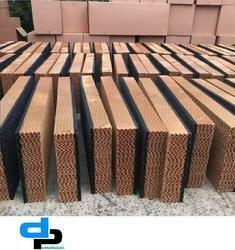 Celdeck Cooling Pad is the ideal and most economical method of cooling.Celdeck Cooling Padis the process in which air is cooled by using the heat in the air to evaporate the water from an adjacent surface. 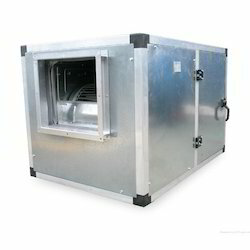 A temperature reduction of 10 to 20°C (50-68°F) can be achieved by passing the hot fresh air through the wetted pads. 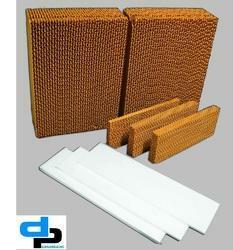 Celdeck pad is made of fluted cellulose sheet those are glued together. 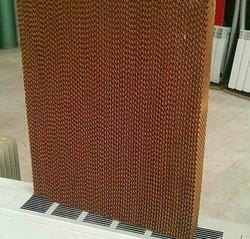 Cellulose sheet is treated with unique ingredients to achieve high cooling efficiency & degradation resistance. As hot air passes through the Evaporative Cooling Pads, a stream of cool and refreshing air is produced. 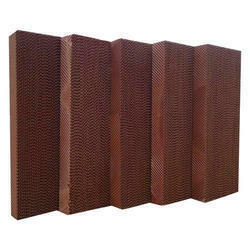 evaporative cooling pads are developed to provide exceptional wetting properties and air flow to achieve optimum cooling capacity and maximum durability. Our cooling pads are your best choice. The cooling pad acts as a device that cools air through the evaporation of water. 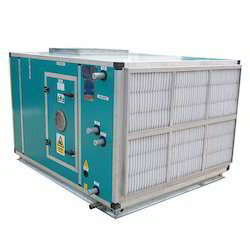 Cellulose cooling pads differs from typical traditional air conditioning systems and Evaporative cooling works by employing water's large enthalpy of vaporization. On days when heat or humidity, excess pollen causes discomfort, people often head off to lakes or the seaside in search of relief. Evaporative air cooling is, in many ways, simulating the cooler conditions so often found at or near large expanses of water. 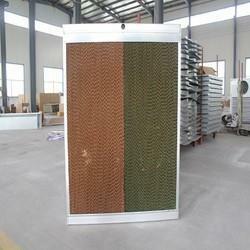 It makes it possible to effectively cool factories, warehouses, offices and many other areas . When sitting in a breeze people feel cooler. 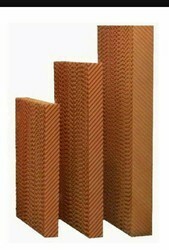 Cooling pads are made of ripple fibre piles which are pressed in an angle of 45° and bound together in accordance with the cross direction of ripples. 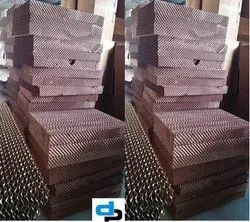 Cooling pads boost superior hygroscopicity , wet stiffness, corrosion resistance and usable life because it adopts piles, with special hygroscopicity, advanced processing technology and the raw material added with special chemicals which will not be resolved by the action of water. 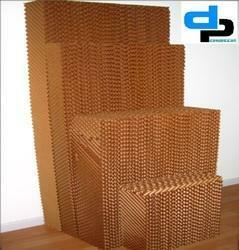 The policy made by our firm makes us affianced in trading and supplying a quality assured range of Cellulose Pad. 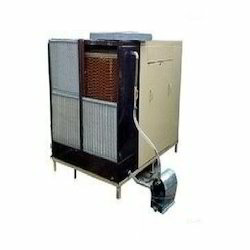 Pad provided by us is generally used in coolers and is apt for absorbing water for providing maximum cooling air. This pad is procured from the most genuine vendors of the market under the directions of our veteran procuring agents. 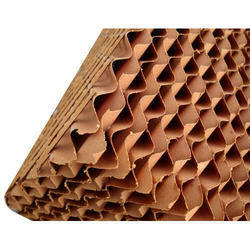 In additionally, we provide this cellulose pad to our clients in bulk quantity at reasonable rates. Looking for Humidification & Ventilation Equipment - Cellulose ?